Game streaming works very well, while backward compatibility could lure users wanting to play older Xbox 360 games. Let’s face it: some companies would be tempted to bundle together features like a new user interface, backwards compatibility, and game streaming to other devices, then ship it as a next-generation product. But Microsoft’s “New Xbox One Experience”—which includes all of those—isn't even a paid upgrade. It’s free. Microsoft is expected to begin rolling out the NXOE beginning today to Xbox One owners. 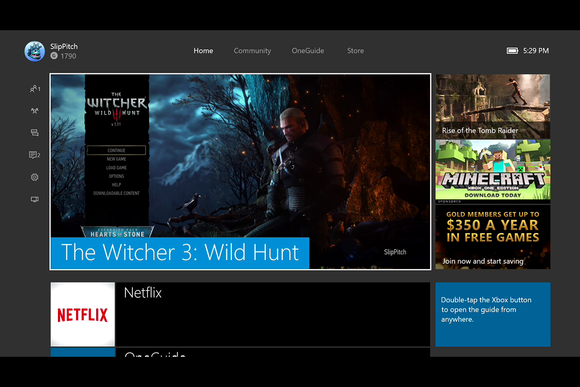 And while many elements of the Xbox Experience remain the same, there’s a fresh new look to it all. But the ability to play older Xbox 360 games, as well as its new game streaming feature, provide the Xbox One an entire new dimension. Why this matters: And Microsoft needs it. Although Microsoft didn’t provide Xbox One sales figures for its most recent quarter, an analysis by Ars Technica pegged the Sony PlayStation 4 at about 4 million units sold during the quarter, versus at most 1.9 million for the Xbox One. At this point, Ars believes, the vast majority of Xbox sales are from the Xbox One. To catch up, Microsoft needs to start throwing some deep passes down the field. 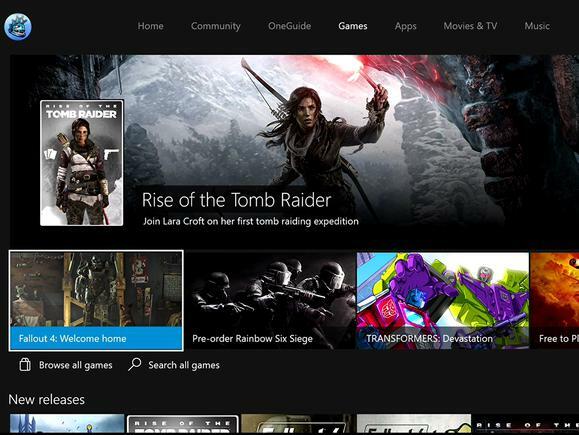 For more of what Microsoft’s New Xbox One Experience looks like, check out our slideshow. Gamers can argue the reasons for the disparity on any number of fronts: That the PlayStation 4 has better games, more games, or just an emphasis on games that Microsoft passed over with its entertainment-focused Xbox One launch. Whatever the reasons, Microsoft’s scrambled to catch up with freebies like Games with Gold and the NXOE, together with what Xbox director of program management Mike Ybarra calls its “best games lineup in its history”. How do you get the NXOE? According to Microsoft's Xbox communications chief Larry Hyrb, the NXOE update will begin rolling out today. There are two ways of getting it: If you use the instant-on power mode your Xbox One will take the update in the background when you put your console into connected standby mode, and then apply the update when your time zone receives it. If your console is in energy-saving mode, you'll need to go to Settings > System to hunt it down. And if you don't have it by Nov. 23, you'll receive a reminder offering it to you. The home screen of the Microsoft NXOE. I’m also disappointed to see Microsoft steal a page from the media that covers them with (*sigh*) ads crowding the right side of the home screen as well as some of the individual Store pages. Games and apps scroll down the screen in a “crawl” of what you played last, with snippets of news from the game hubs Microsoft has built out for many games. For a cord-cutter's view of the NXOE's OneGuide interface, read our story at TechHive. Of far more use are a vertical column of icons to the left of the screen, bringing you quickly to a list of Friends, Windows 10-style Notifications, a Parties icon to quickly group up you and your friends, and an icon to snap an app in part of the screen. Cortana, the embodiment of Windows 10, will appear later in the NXOE, complete with specialized commands focused on the Xbox experience. The left-hand nav bar provides quick shortcuts to frequently-usd categories. I’m disappointed to say that I haven’t had a chance to test out the One’s ability to play the older Xbox 360 games, in part because I owned a PlayStation 3 during the Xbox 360 generation. I never had a chance to play Red Dead Redemption, for example, as well as a number of other classic Xbox 360 titles. Game streaming, however, works like a charm. 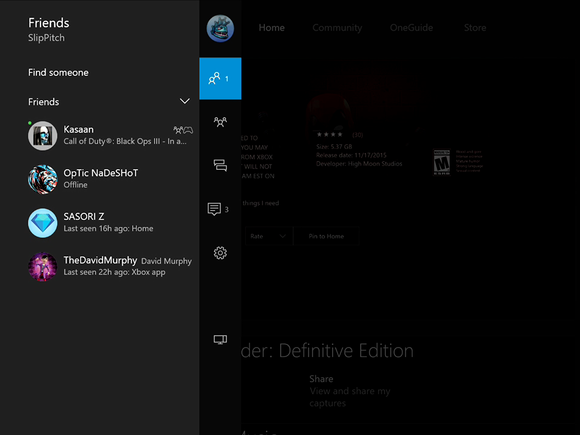 Using the Xbox app on Windows 10, you have the option to “remotely” connect to the console, provided both the PC and console are on the same network. Once connected, you can navigate the Xbox One on a notebook or tablet just the same as you would if you were seated in front of it, provided you have a Microsoft controller—Xbox 360, Xbox One, or the new Elite Controller—connected to the PC. Graphics fidelity will suffer somewhat as Microsoft attempts to keep the framerate up and lag down. 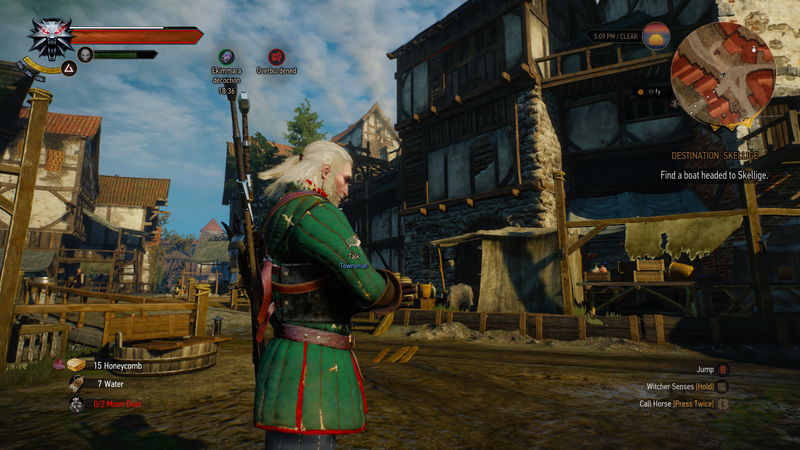 I never felt like I was lagging, though, either playing a racing game like Forza Horizon 2 or The Witcher III. 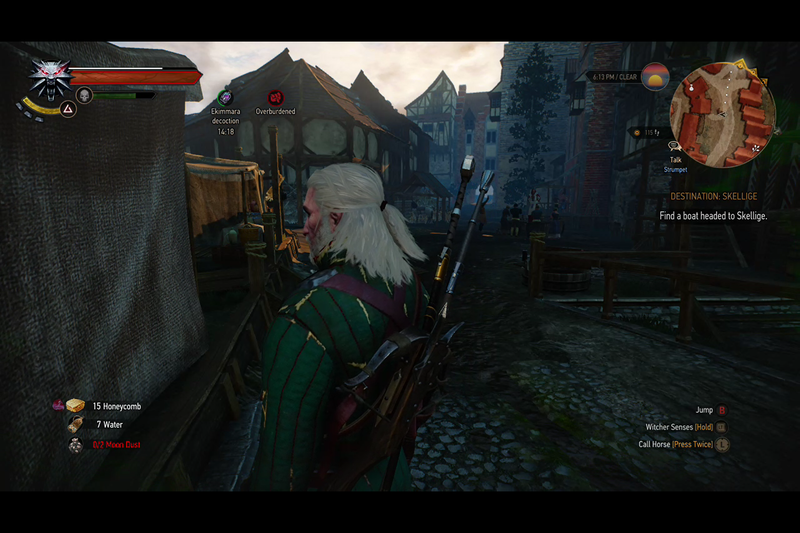 Streaming a game will reduce the resolution compared to the native Xbox One, but I never felt cheated. 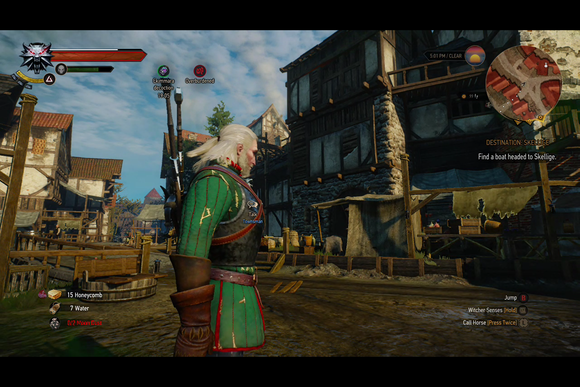 If you’d like, you can also adjust the graphics quality of the streamed content to suit your network; I really didn’t notice too much difference between the “medium” and “very high” streaming settings, although the Xbox app’s streaming metrics reported that streaming The Witcher III on medium required about 6 Mb/s in sustained throughput, while very high required between 9 and 10 Mb/s. The surprising hit came in terms of CPU bandwidth; streaming at high settings chewed through about 50 percent of my CPU on a Core i7-based Surface Book with the discrete graphics base. My “System” memory consumption under the Task Manager also spiked to 1.4GB. Keep in mind, however, that your streaming performance will be impacted by the available bandwidth, which in turn is governed by interference, network traffic, and other variables. Your mileage will vary. Besides Cortana, Microsoft hasn’t said what’s next for the Xbox One; we can certainly expect more Xbox 360 titles to be added, mouse and keyboard support to arrive, and—far in the future—some integration with Hololens, presumably. We can also hope for the personalization options to return. What is clear, however, is the NXOE’s emphasis remains largely on games. Microsoft already has enough hardware whose emphasis is on productivity; at the end of the day, though, everybody just wants to sit on the couch and relax. Updated at 9:04 to add Hyrb's comments on the availability of backwards-compatible games and again at 4:12 PM after backward compatibility began.